Choral Music for Mother Earth. Songs & chants for Earth Worshipers and lovers of the natural world. With depth & humor, Gaia's Voice sings invocations, hymns and folk-style songs you'll want to sing along with. These recordings, released in 1990, hold a special place in the world of Pagan music. Much of the music being made at that time was in a folk or rock style. To our knowledge, there are only two Pagan choruses to date: ourselves and the incredible Mothertongue out of Boston. Originally brought together as the Rainbow Chorus for Anodea Judith's "Crossing the Rainbow Bridge" book & ritual -- an event held in the San Francisco Bay Area -- the friends who made up this group so enjoyed the work they had done and the potential it revealed that they decided to continue as Gaia's Voice. Gaia's Voice went on to become very active in Bay Area Pagan events, performing at many public sabbats. We also performed at book release parties, concerts and had the privilege to witness and sing for a number of Pagan partnership ceremonies. As with many older recordings, when we went to the original masters, we found that they were virtually unlistenable. Then we discovered a sealed copy of the original cassette release with good sound. After much work, we feel that we have obtained the best possible remaster. One benefit of using this version is that an extra track had been accidentally included in the first release of the cassette. That track, the haunting "Wind Whisper, Wind Wail," is included here. 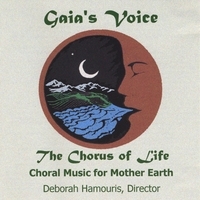 Gaia's Voice ended rehearsing and performing together in 2005, and now this CD is available from founding director, Deborah "DJ" Hamouris.